The air was chilly in the morning, but it warmed up quickly. I stopped by the kitchen tent and filled my tin cup with cowboy coffee; I was getting addicted to the stuff. We heard bells, and went down to watch the horses come in to the corral. We spent a little quality time with Sparky the collie; he was only about a year old, and quite playful. We had a super breakfast of fried eggs, sausage, pancakes, and cinnamon rolls left over from the night before. And to think we had wondered if the food would be edible! 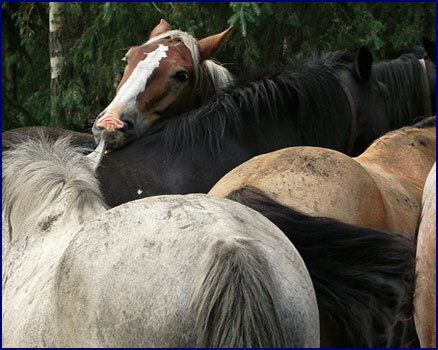 The horses arrive at the corral in the morning. The wranglers saddled up the horses for the day's ride. Pete, Paul, Pat and Rob were all staying behind to rebuild the hay shed; it was quite old and the logs had become rotten, and besides, Lois wanted it moved over a bit to make more room for her rutabaga garden. 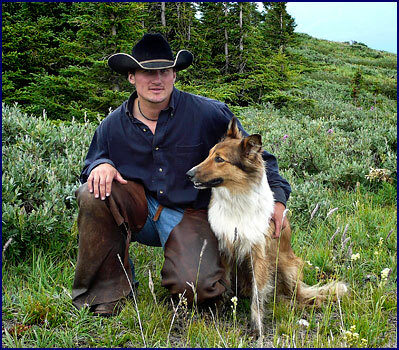 Today's trail leader was Mark, Sparky the collie's owner, and he was assisted by his girlfriend Alyssa and several of the other younger wranglers. We set off in a different direction from the day before, but again soon headed uphill. I had feared Magic might be exhausted after the previous day's exertion, but she seemed fresh and eager to go. Jineen and I were scouting for wildlife, but these younger wranglers seemed less in tune with nature than Pete and Paul, and between the guys talking loudly and Sparky running about, we figured we had little chance of seeing bears. After about an hour we came out of the aspen forest to a log cabin at the edge of an open field. Mark told us it was a trapper's cabin, but it looked more like a summer home. It had a nice front porch with homemade log furniture and great mountain views. We climbed about two thirds of the way up the mountain before stopping for lunch. 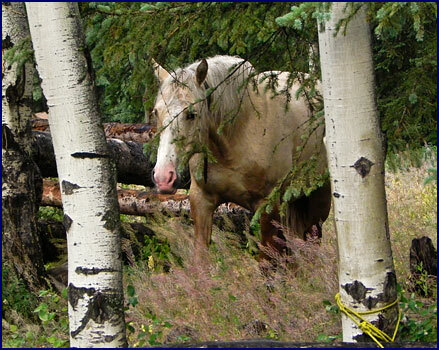 We tied the horses to trees and sat on a grassy ledge with an aspen forest at our backs. Before us was an unobstructed view of the Smoky River valley and the mountains beyond. We cooked hotdogs on a fire, and searched the slopes across the valley with the spotting scope, looking for wildlife. The high powered hunting scope could pick out animals that were miles away, but there were none to be seen. We relaxed in the sunshine, enjoying the day. Everything was quiet, peaceful, almost a little sleepy. But suddenly there was some excitement - two elk ran swiftly across the meadow just below us, dodging in and out among the bushes. Having spent the better part of an hour searching with the scope for animals on mountainsides over a mile away, here they were less than 100 yards from us! Then it was time to be on our way. Everyone was just getting to their feet and packing up, and I happened to be the only one looking down the slope when it happened: two grizzly bears loped across the meadow below us. They were moving fast, the sun gleaming on their brown backs as they darted in and out of the underbrush, following the same path the elk had taken. I pointed excitedly and no doubt babbled incoherently, but by the time the others looked in the right direction they were gone. It was a brief encounter, but it was really exciting to see the bears in action. I wonder if they were hunting the elk? We headed on up the mountain. The trail was steep in places, but easy to follow, and much less severe than the terrain we had covered the day before. At the top, we stood on a large flat rock outcropping above a pond and admired the spectacular vistas all around us. The Smoky River wound through the valley below like a silver ribbon, with steep mountain slopes rising beyond it. Looking off the back side of the mountain, we could see the town of Grand Cache in the distance. We tied the horses to the tops of some small scrawny pines, the only trees at the summit. It wasn't long before Jineen's horse Thunder managed to entangle himself, wrapping his lead rope around a hind leg. Unfazed, he stood calmly on three legs with the ensnared limb held awkwardly off the ground while we extricated him by slipping off his halter. Presently it was time to head back down. 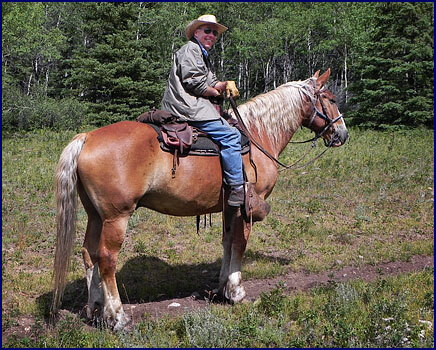 Mark had us lead the horses down the steepest part of the trail, to the shelf where we had stopped for lunch. Walking the horses down that precipitous path on foot seemed rather risky, and we were slipping and sliding under their feet. I was in the front, and ended up well ahead of the others for much of the way. Approaching the area where I had seen the bears earlier, I had my camera ready; I was imagining scenarios where I took a great photograph of a massive grizzly, towering on its hind legs in front of me. 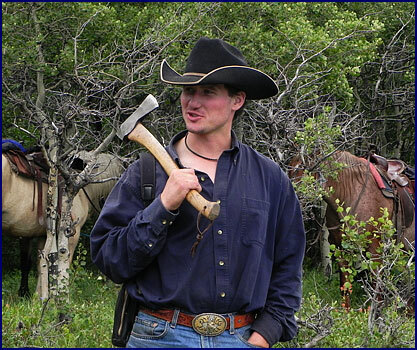 It did briefly occur to me that if the guides carried rifles because of possible bear encounters, then perhaps I shouldn't be so far ahead of the group . . . but as fate would have it, I encountered no more bears. Just as well, I am sure. We returned to camp about six o'clock, after spending seven hours on the trail. 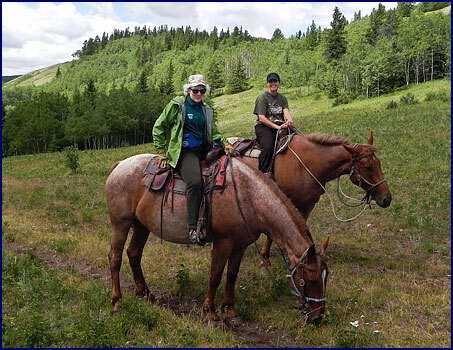 By now I had gotten quite used to the western saddle, and my aches and pains were minimal. It had been an excellent outing, though lacking the exaltation of the previous day's ride. 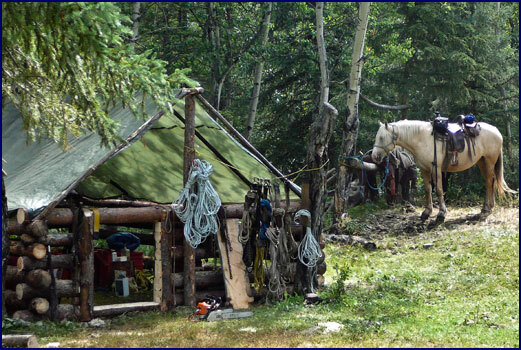 When we rode into the camp, we were impressed to see that the new hay shed was complete. Slightly smaller than the old one it replaced, it was built of sturdy logs, and the tarp roof was suspended on a brand new frame. The doorway was narrow, and had a log across it four feet from the ground; people could duck under, but it kept the horses and mules out. We congratulated the men on their efficient building skills; we were amazed at how much they had accomplished while we were out on the ride. We sat around the campfire, sipping our wine and talking with the others guests. Jineen and I particularly enjoyed talking with Pat, who was very insightful and seemed interested in many of the same things we were; he was taking a leave of absence from his job to spend time in the wilderness. 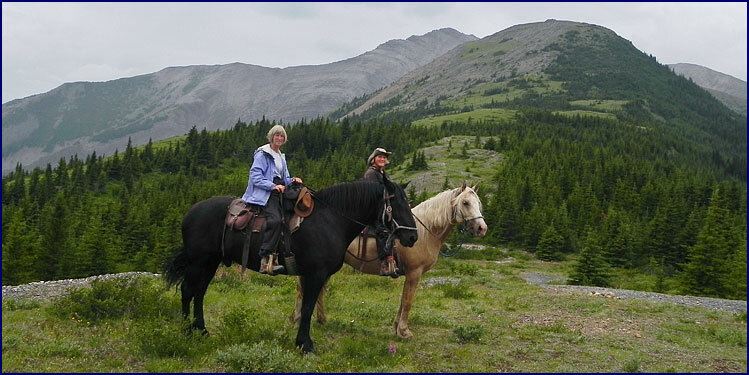 Louise and Shelly had bought the trail-riding trip at a charity auction; Pete donates such rides to a number of organizations that promote conservation of the wilderness areas. We learned that Shelly had won a bronze medal at the Olympics in Tae Kwon Do; what are the odds that out of four guests in camp, two would be former Olympians? Paul was an expert with a chainsaw, and had been the primary log cutter on the shed-building project. He sawed a wafer-thin slice off the end of a log to show Jineen and I the pattern of the rings; the trees were very old, though so far north at high elevation they were not very big around. 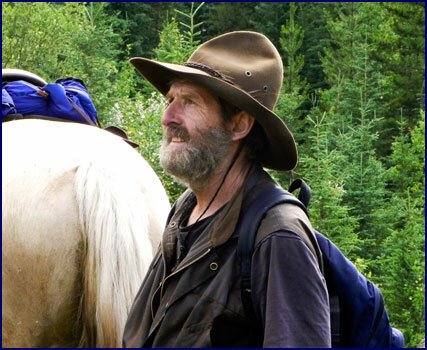 Sitting by the campfire, Paul told us that he had enjoyed seeing us ride, and that he was impressed with how we sat our horses going down the steep mountainside the day before. This meant a lot to us, because from the start we had admired Paul's horsemanship and his quiet alliance with the horses. It was steak night. Pete lowered an iron grill that was suspended from the rafters down over the campfire, and cooked thick steaks over the open flame. They were perfection - juicy pink on the inside, charred on the outside; it might have been the best steak I have ever tasted. We sat around the fire and talked long into the night. Pete described the hunting operation, and told us stories from past seasons. We went to bed after midnight, to the sound of raindrops pattering on the tent. I drifted off to sleep, thinking about mountain rides, and campfires, and horses grazing on the wild mountain slopes in the night. Yes, I think Drifter would like it here . . . In the morning the sky was clear again. The horses came into camp early, and the wranglers ushered them into the corral. Lois served us steak and eggs, bacon, and camp-made biscuits, washed down with cowboy coffee; it might have been the best breakfast I have ever had. Pat took Jineen and I berry picking in a meadow down past the corral. Everything seemed clean and fresh after the night's rain; the sky was cobalt blue and the aspen boles glowed white in the morning sunlight. We sampled the ripe mountain raspberries, freshly rain-washed, sweet and delicious. When we came back past the corral the horses were sleeping. Magic was the only one on her feet, standing under the tree dozing - the rest were all lying down or flat out. I wandered along the stream beside camp. Though the creek was fairly small, it was surrounded by a wide rocky bed, which was no doubt a raging torrent during the spring snowmelt. I built a cairn of stones on the shore, thinking to myself, I'm leaving my mark - I wonder how long it will stand? It was time to head back to civilization. We were sorry to leave; we would miss Pete and Lois, and life at the camp. 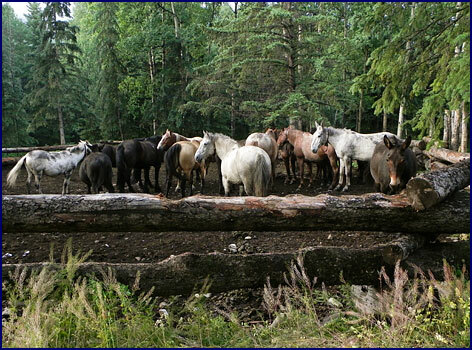 We left our belongings to be loaded onto the pack mules, and prepared to mount up. It was with regret that Jineen and I said goodbye to Paul - we were like kindred spirits. Pat led us, along with Louise and Shelly, as we rode out ahead of the pack string toward the park gate. We walked slowly, looking for wildlife, but all we saw were a few elk tracks. Magic and Thunder were probably looking forward to seeing the last of us; they would get a week to rest before the next group of riders came in. We took a side path to a high waterfall. Tying the horses, we climbed down to the base of the falls and stood in the spray, the noise of the water echoing in our ears like thunder. Finally reaching the staging corral at Sulpher Gates, we said goodbye to the horses, and to Pete and Lois. Spending four days in their wilderness camp had been an unforgettable experience, and we had made new friends. Before leaving the park, we followed an excellent tip from Pat, and drove to the end of the road to a place where two rivers join. We followed a path along the top of the cliff - it climbed several stone staircases and took us to a series of four overlooks, each higher and more spectacular than the last. The Sulpher River came down through a narrow steep-sided gorge, passing between tall stone cliffs and merging dramatically with the larger Smoky River - hence the name Sulpher Gates. The chalky grey-green waters rushed below us, while the rays of the afternoon sun highlighted the bright hills beyond, framed by rugged peaks in the distance. After four days in the wilderness, it seemed a bit strange to return to places with roads and houses, and not altogether appealing. We drove south, back towards Hinton. We passed a coyote by the side of the road, picking at a carcass. 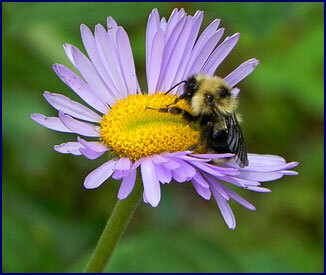 Finding an area with cell phone service, we pulled over on the side of the road to call home. Jineen and I like to explore the smallest roads we can find, and the evening is a great time for spotting wildlife. We had several hours until dark and we wanted to make the most of them. Following a sign that said Viewable Wildlife, we turned down a small gravel road to Graveyard Lake. 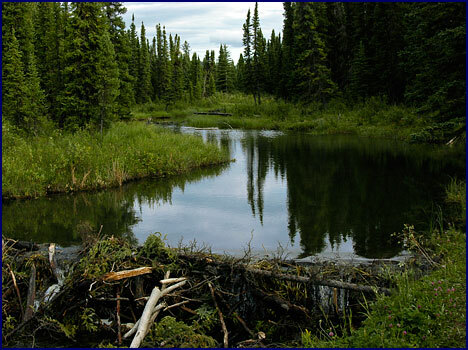 We parked by a beaver dam and walked along a tiny path beside a broad stream. 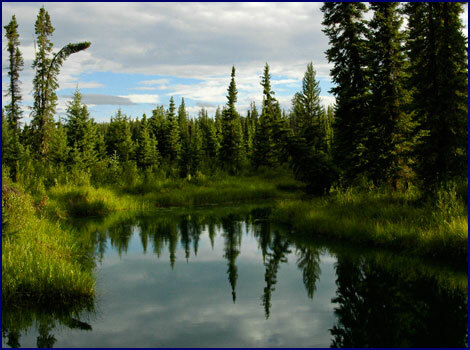 The trees and the evening sky were reflected in the mirror surface of the still water. In the waning evening light we headed down a small byway towards the town of Brule. We turned off on a tiny dirt track which followed the top of a ridge overlooking the river. Soon the track became rougher, fainter - this was just the scenario we had avoided telling the car rental guy about when the subject of the vehicle's ground clearance came up. Before long we came to an impressive overlook; the river below us gleamed silver in the evening light, and the last rays of the sun were illuminating the rocky peaks in the distance, causing them to glow with a warm light. Finally arriving in Hinton around ten o'clock, we had dinner at the A&W fast food place, the only restaurant in town still open at that late hour. We checked into the Twin Pines again, and got the very same room we had stayed in the night before we went to Willmore. We drifted off to sleep listening to the cars go by, and missing the quiet of the wilderness.